Verin is located in the region of Galicia northwest Spain, close to the border of northern Portugal. If you are a wine lover this area is dominated by vineyards because it is also the wine region of Monterrei. The locals in this small town speak Gallego which is sometimes difficult to understand even for those who know some Spanish. The town is very clean and welcoming with a lovely river running through it, and along the river banks there is a playground and safe place to go for a dip for those traveling with young children. The old district is not very big so it would not take long to look around, but there are several lovely old churches to seek out. Should you wish to stop for lunch there are also a number of tapas style bars. If you can, time your visit with Shrove Tuesday and witness the town’s rather unique Carnival which is considered one of the most original in Spain. It has a very medieval feel about it, although also influenced by the carnivals in Brazil, with masked figures running through the streets, cow bells strapped to their waists, and carrying whips. There are also other festivals throughout the year such as the Three Wine Men Parade in January and the summer festivities in August. For those who enjoy outdoor activities this area also offers boat trips and horseback riding. If you enjoy hiking, cycling, hunting or fishing, be sure to make a trip to the Parque Natural de O Invernadeiro. The park covers an area of 5,693 hectares with beautiful hills and forest and two rivers running through it; the Riberia Grande and the Ribeira Pequena. The park also has a great deal of wildlife which includes fox, wild boar and several species of birds. 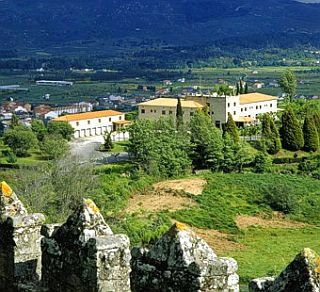 One of the main attractions though in this area is the 12th century Monterrei Castle. You can see it in the distance as it is only 2km away in the direction of Ourense. It was built to protect the frontier and consequently played an important role during the war between Spain and Portugal. Because of its elevated position it is possible to see the hills of neighbouring Portugal on a clear day. Within the perimeter of the castle lies a monastery, a Pilgrim Hospital near the entrance, and a small village that was eventually abandoned in the 19th century. The castle certainly looks very impressive from a distance, and perhaps less so once you actually get up close, but it is particularly stunning at night when it is lit up by floodlights. 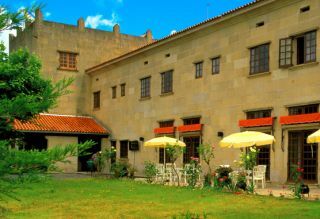 Directly opposite the castle is the Parador Verin (Hotel Monterrei) which was originally a country manor house and has since been converted into a three star hotel. With a very comfortable interior and welcoming atmosphere it is a delightful place to stay while you are exploring this part of Galicia. It has wonderful panoramic views of Verin and the vineyards beyond, a garden and play area for children, an excellent restaurant, and seasonal swimming pool. As mentioned earlier this is a major wine region, which they believe was first started by the ancient Romans. The wines from Monterrei were renowned during the Middle Ages due to their excellent quality, and being on a par with Oporto’s wines exportation began to Latin America. Unfortunately the region suffered badly during the 19th century and many of the vineyards were closed down. This was because their work force (the harvesters) had to seek work elsewhere which made production virtually impossible. Things turned around though when Spain eventually joined the European Union, and so there is no shortage of excellent wines to enjoy while you explore this fascinating region.